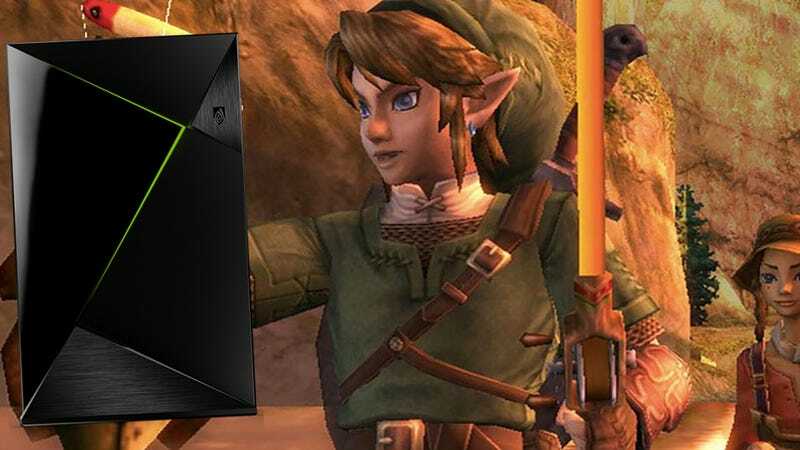 If you live in China and own an Nvidia Shield, you can now play great Wii games like The Legend of Zelda: Twilight Princess—no need to own a Switch, a 3DS, or even the console that Twilight Princess originally appeared on. All you need to enjoy one of the best games Nintendo has ever made is a game console not actually built by Nintendo. Nintendo, I hate you for this. The company is slowly releasing its firm grip on its first-party properties, starting with smartphone games. Popular properties like Mario, Animal Crossing, and Fire Emblem have all appeared, in some fashion, on Android and iOS devices. But this deal in China really takes the cake. As The Verge mentions, the collaboration was first noted by Daniel Ahmad, an analyst at Niko Partners. Since then Bloomberg has confirmed that Nvidia started selling the Shield set top box in China December 5th, with three Nintendo games pre-installed: The Legend of Zelda: Twilight Princess, New Super Mario Bros. Wii, and Punch-Out!!. All three games were originally available for the Wii nearly a decade ago at a measly 480p resolution. According the Ahmad they now run on the much faster Shield at what should be a nice and crisp HD resolution—meaning 720p or 1080p. That’s not the 4K most TVs (and the Shield) are capable of playing content at, but it’s superior to the Wii you might have tucked away in a closet somewhere. The games are likely appearing on the Nvidia Shield because these two companies have developed a solid working relationship. The super popular Nintendo Switch actually uses a modified version of the Tegra chip found in the Shield—which means Nintendo coders are already very familiar with the architecture the games would need to be ported to. If that’s the case, it’s unlikely Shields in the US will see these games legally—which is a major bummer to me personally, as the Nvidia Shield remains my absolute favorite set-top box. But remember, the Nvidia Shield runs on Android. That means these games are likely ports to the Android OS, so it’s only a matter of time before someone attempts to pirate them and make them available to other regions or Android devices.